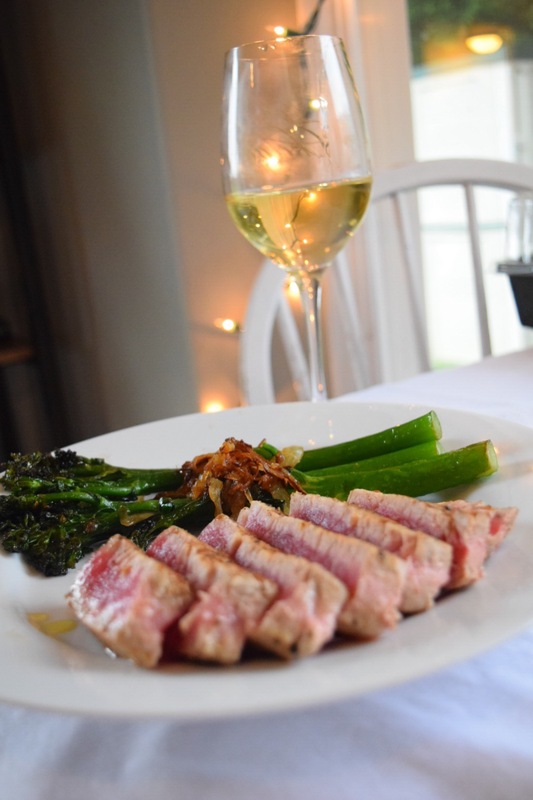 Pan Seared Ahi Tuna Steaks with Broccolini – Abbey Co. I absolutely LOVE ahi tuna steaks for dinner in the summer. 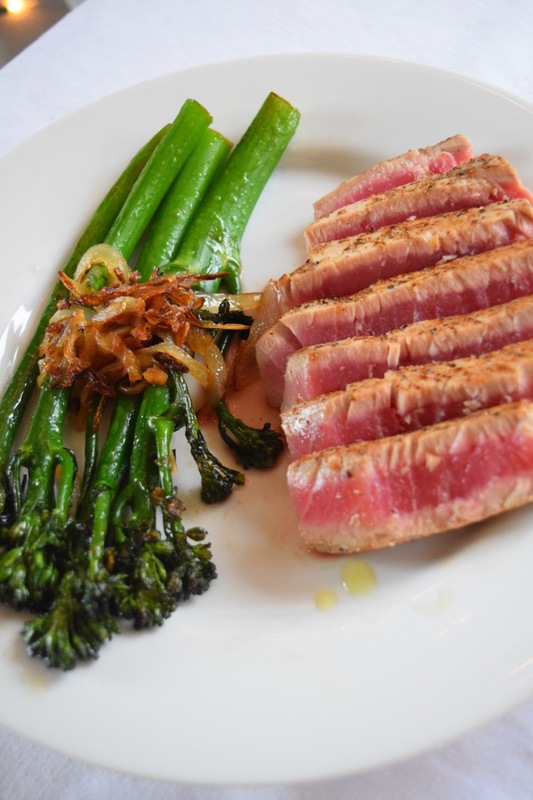 Ahi is such a light and fresh meat, and on a hot day where the last thing you want is a big, heavy dinner, these are perfect. The other great thing about them is that they cook SO QUICKLY, that your time over a hot stove is minimal. All it takes is a good sear on either side (approx. 1.5 mins each side) and you have a perfectly cooked tuna steak. My two tips would be to 1. make sure your tuna steaks are fully defrosted so that the middle is not cold and 2. do not over cook your tuna steak. If you cook it grey all the way through then you are defeating the purpose of eating one of these glorious steaks, and might as well be having tuna from a can! Okay that is a little dramatic, but you will be sad if your meat ends up well done. This meal can be made using one medium-large frying pan. Start by melting 2 tablespoons of butter in the pan. Toss in your onions and saute about 3 minutes. Add broccolini and continue to sauté until your onions begin to carmelize and your brocollini become al dente. I like to let the little tips of the broccolini crisp and blacken just a little bit. If you want your broccoli to cook faster you can always blanche them in a pot of boiling water first… I however am lazy and don’t want to wash that extra pan, hence my one-skillet technique. 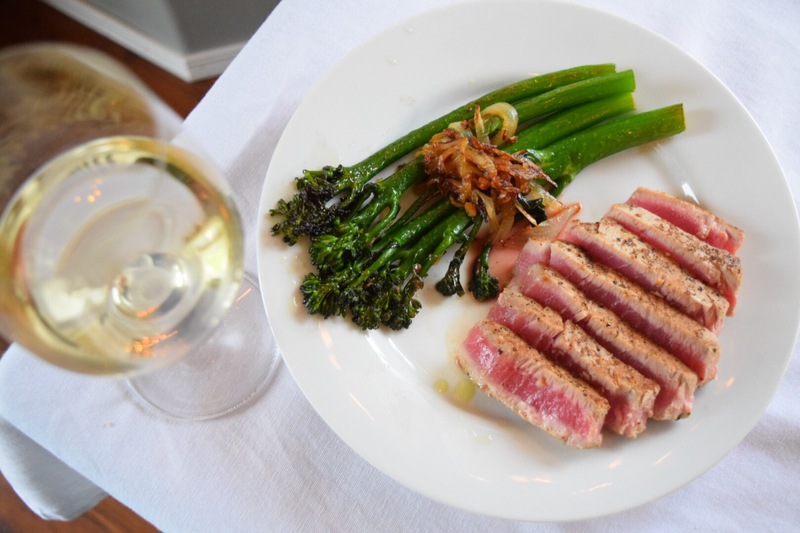 While your broccolini is cooking, take your ahi steaks and pat them with a little soy sauce, sesame oil, then dust them on each side with salt, pepper, and sesame seeds. Take your cooked broccolini and set them aside on a serving dish. Use a slightly damp towel to wipe any excess bits of broccolini out of the pan so you don’t get little burnt leftover bits on your tuna. Melt your remaining 2 tablespoons butter in the pan, and turn your heat to medium high. Toss your ahi steaks into the pan, sear on one side for approx. 1.5-2 minutes, flip and do the same on the other side. You don’t want to burn your sesame seeds, so make sure your heat is at a nice point where your meat is searing but spices aren’t blackening too much. Then dish up and serve! I like to take a small dish and mix a few tablespoons of soy sauce with a dot of wasabi for dipping… but that is totally optional! I hope you enjoy blog friends! That looks PHENOMENAL – I wish I had better seafood options down here. I live in the desert 😥 I will be trying to find somewhere to buy good tuna steaks so I can make this. It falls perfectly within my diet – which is pretty strict right now – and I’m always looking for great, light recipes! Thank you for sharing! Oh bummer! It is so hard to get ahold of good seafood away from the coast! Even though we are coastal I still have to do a little hunting to find fresh ahi. We have to go to our local organic/boutique grocer (like Whole Foods if you have them), so maybe if there is a place like that give them a try and see if they have the steaks frozen! This looks amazing! I’ve never made ahi at home before but I’m totally going to try this. It is so easy! Just a few minutes to sear each side and you are done! I am going to try the sesame seeds and the soy sauce next time I do Tuna steaks. 🙂 Great recipe! Previous PostPrevious May 2017 Recap! Next PostNext The internet is going crazy over this new low-calorie ice cream… Have you tried Halo Top yet?